Op Ed: How Safe is the "Green" Economy? Photo credit: Glass recycling worker. Only strong worker organizing can guarantee that jobs in the so-called green economy will be healthy and safe for workers. Former Worksafe Executive Director Gail Bateson contributed to this op-ed, which originally appeared on Alternet on March 30, 2016. Americans have made a decision: We’re throwing away the throwaway economy. Curbside recycling is available in more than 9,000 municipalities, and one-third of America’s waste stream is now diverted from landfills. It’s great that we’re conserving raw materials, saving money and reducing the greenhouse gas emissions. Now it’s time to make another decision: We need to raise pay and improve working conditions for recycling workers. These are green jobs and good for the environment. But they are also dangerous, with high rates of serious injury and even the risk of death. 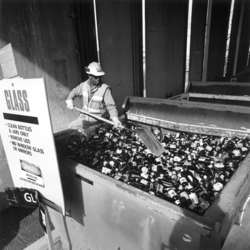 Glass Recycling Worker Glass recycling worker. On March 1, a 42-year-old worker was killed at a Waste Management recycling plant in northeast Philadelphia, crushed to death under a one-ton bale of paper. Ironically, on the very same day, across the country, a Bay Area recycling firm was honored by workers and community leaders for “dramatically improving working conditions.” At an interfaith luncheon, the Sierra Club’s Ruth Abbey recognized Chris Valbusa, general manager of Alameda County Industries (ACI), for the firm’s efforts to partner with its workforce in creating safe, sustainable jobs. ACI and Waste Management are both private companies. Like nearly all recycling firms, however, their workers are paid by us, the taxpayers, through contracts awarded by local governments. When you drop a newspaper, bottle or food waste in a recycling bin, it’s good to know it stays out of a landfill, but do you know much about what happens next? Unfortunately, the hazardous work of recycling can be hidden by employers who cut corners on safety and exploit workers. Long before a worker was killed at Waste Management’s Philadelphia facility, the Philadelphia Project on Occupational Safety and Health (PhilaPOSH) had received reports of workers getting sick on the job. We heard stories about dizziness, nausea and workers coughing up blood and black mucous. You’d be surprised to see some of the stuff that winds up in a recycling bin, including syringes, toxic chemicals, animal carcasses and even human waste. A 2015 study by public health experts found that recycling workers are injured on the job more than twice as often as workers in other U.S. industries. Among other findings: 15 recycling workers died on the job in a two-year period between 2011 and 2013. Facing such hazards, it’s critical that these workplaces have active health and safety programs that involve workers. Among other requirements, workers need proper training in materials handling, access to gloves and other personal protective equipment, and good ventilation. At the Waste Management facility in Philadelphia, we learned that a large proportion of workers were temps, assigned by an agency called Centrix Staffing. To check the company’s approach to safety, we asked a Spanish-speaking colleague to apply for work there. He was shown a short training video—in English—and deemed ready for assignment, with no evidence that he understood the material presented to him. The incident was captured on film and can be seen in the excellent documentary film, A Day’s Work, which details the hazards, including risk of fatal injury, faced by workers in America’s growing temp industry. Across the country in Alameda County, recycling workers at ACI were also temps until 16 months ago. Frustrated by poor conditions and low pay, workers began an organizing campaign with support from the International Longshore and Warehouse Union. The effort included legal action to enforce living wage laws. Workers also attended classes on their own time to learn about safety and their rights on the job at trainings provided by the University of California’s Labor Occupational and Health Program. In addition, a labor community coalition, including Worksafe, joined workers to contact elected officials in communities where ACI has recycling contracts. ACI responded in a positive way to the growing pressure. The company dropped the temp agency and made the workers real employees. In October 2014, ACI’s recycling workers voted to join ILWU. Instead of fighting the outcome, ACI management negotiated a fair agreement with a bargaining committee elected by workers. The results have transformed pay and working conditions at ACI. Previous wages of $8 an hour will reach over $20 an hour by July 2019. Workers also now earn sick pay, vacations, holidays and health insurance for their families. And safety has improved dramatically, thanks to an active health and safety committee that meets every three months—with a strong voice for workers. This remarkable story of progress shows a clear path to reducing illness and injury on the job and preventing future tragedies. Listen to workers. Respect their right to organize. Support smart, effective labor-management cooperation. The people who handle our recyclables work for us. Let’s treat them with the dignity they deserve. Gail Bateson is the former executive director at WorkSafe, based in Oakland, CA. Barbara Rahke is executive director of PhilaPOSH and board chair of the National Council for Occupational Safety and Health.